It is in the early years of a child’s life that we lay the building blocks for health, wellbeing, learning and relationships for the future. When children have a protective, safe, secure and loving environment to grow up in they can flourish and thrive. From pregnancy and through childhood children benefit from a positive and stable home, with healthy and supportive relationships that enable them to become healthy and happy adults. When a child grows up having positive experiences they are more likely to go on to become parents who give their children the same experiences. The first 1,000 days of a child’s life are from the time the baby is conceived up to their second birthday and this is where the brain does most of its developing and learning for the future. This means that the things a child experiences during this time will have an effect on them throughout their lives. When children have a safe and nurturing environment to grow up in they become resilient and more able to cope well with future life events. Sometimes children experience stressful and traumatic events during their childhoods, such as suffering verbal, mental, sexual and physical abuse or being raised in a household with domestic violence or drug and alcohol abuse, parental separation or having a parent in prison. These are called Adverse Childhood Experiences (ACE’s) and they are harmful to the development of a child’s brain and can cause many problems later in life such as poor health and anti-social behaviours. We know that children who experience ACE’s are more likely to experience poor physical and mental health, suffer from harmful diseases, not to do well at school and struggle to form good relationships later in life. being a healthy weight before starting a pregnancy. Women who are obese are more than twice as likely to have a stillborn baby, and the risk increases with increasing maternal body mass index. Babies born to obese mothers are less likely to be breastfed, more likely to have congenital anomalies, especially neural tube defects, and to require admission to neonatal units. The prevalence of obesity can be intergenerational, as women who are obese during pregnancy are more likely to have obese children. advice about individual health and genetic conditions ; and general advice about when and how to get help as soon as pregnancy starts. Pregnancy can be a positive life choice for many teenagers, however if the pregnancy is unplanned it can be associated with negative health outcomes for both mother and baby. Young mothers are more likely to suffer postnatal depression and less likely to complete their education. Children born to teenage parents are less likely to be breastfed. Low birth weight, when a baby is born weighing less than 2,500g is caused by either premature birth or failing to grow in the womb (or a combination of both). There is a clear link between low birth weight and socio economic deprivation. Low birth weight is so strongly connected with poor health and deprivation that it is sometimes used as a general measure of poverty in the community. The biggest risk factor for low birth weights is exposure to tobacco smoke during pregnancy (both maternal smoking and second hand smoke). Other risks are maternal substance misuse, diet, sexual health and low body mass index (BMI). In 2016, there were 80 low birth weight babies in Denbighshire, 8.3% of all live births. In Conwy, there were 57 low birth weight babies, 5.5% of all live births. The Wales average was 5.4%. Major health concerns for the first two years of life are breast feeding, immunisation and maternal mental health. Breastfeeding protects the health of mothers and babies. Breastfed babies are less likely to have to go to hospital with infections, and are more likely to grow up with a healthy weight and without allergies. In 2016, 354 babies in Conwy were exclusively breastfed at 10 days following birth, this represents 35.3% of all births. In Denbighshire the number was 306, representing 32.2%. The Wales average was 33.8%. In 2016/7, 87.6% children achieved their vaccination rates by 4 years, (four in one pre school booster (against diphtheria, tetanus, pertussis and polio), Hib/men C booster and two doses of MMR (measles, mumps and rubella) in Denbighshire the rate was 86.4%. The Wales average was 84.6%. The mental health of the mother has an impact on the child during and after pregnancy. If the mother is stressed or anxious while she is pregnant, the child is more likely to be anxious. [iv] Mental ill health impacts on the ability to provide positive parenting and this is particularly important in the first two years of life when attachments are forming and brain development is most rapid. The parenting ability of teenage parents can be affected by factors such as conflict within family or with a partner, social exclusion, low self-confidence and self-esteem. These factors can affect the mental wellbeing of the young person. The impact of being a teenage parent can be felt by both the mother and father. Emergency admissions for injury are used as a general indicator of health and health inequality. Injuries are a key cause of death and disability among children and place significant burden on individuals, families, health services and wider society. The 0-4 age group are exceptionally vulnerable to injuries within the home environment. Dental decay in young children is strongly linked to deprivation and frequently leads to pain and infection necessitating hospitalisation for dental extractions under general anaesthesia. As well as the discomfort of pain and infection, young children can experience loss of sleep, absence from school and low self esteem. Information about domestic abuse is available in section 2.14 ‘Tackling domestic abuse’. Being a victim of crime is an adverse childhood experience for any young person that can have longer term effect. The number of children and young people reported as falling victim of crime has steadily increased year on year across all North Wales local authorities. This could be due to a number of reasons including increased ability/ willingness to report; increased number of crimes committed; increase in particular types of crime such as cyber-crime. Information about childhood exposure to alcohol and substance misuse is available in ‘People make healthy lifestyle choices. The early years is defined by Welsh Government as the period of life from pre-birth to the end of Foundation Phase or 0 to 7 years of age. These years are a crucial time for children. Children grow rapidly and both their physical and mental development are affected by the environment in which they find themselves in. The first three years of life are particularly important for healthy development due to the fast rate of neurological growth that occurs during this period. The provision of appropriate childcare plays a major part in achieving Welsh Government’s aims, particularly in the pre-school years. It also helps parents, both through providing advice and guidance, by demonstrating practical child care skills and through offering the child care support needed to allow parents to take up work opportunities. Local Authorities have a responsibility to make sure there is sufficient childcare within their local area to meet the needs of working parents. Take up or remain in work. Undertake education or training which will help them to get work. about 54% of children in need in Wales achieve the foundation phase indicator compared to 87 of all children. about 55% of children in need in Wales achieve the core subject indicator at key stage 2 (age 11) compared to 88 of all children. about 13% of children in need in Wales achieve the core subject indicator at key stage 4 (age 15/16) compared to 55% of all children. Parenting skills are normally learnt skills from our own experiences growing up as children. If these experiences lack some of the core elements of bringing up children in a safe and nurturing environment it can have a detrimental effect on the child as they grow and so the cycle of inappropriate parenting continues. Those who provide parenting includes mothers, fathers, foster carers, adopted parents, step parents and grandparents. Provision of parenting support is needed to break cycles of inappropriate parenting and raise parents’ confidence in their skills to raise their children in a positive and nurturing environment. The provision of services and support can also improve parent-child relationships; improve parents’ understanding, attitudes and behaviour and increase parents’ confidence in order to promote the social, physical and emotional well-being of children. Over the last few years Welsh Government have implemented parenting skills initiatives under the child poverty agenda such as Families First, Flying Start and Communities First. While Flying Start and Communities First have focused on the more deprived areas and have other restrictions such as age for Flying Start, Families First has been open to any family who needed early support to prevent escalation of need to statutory services. Flying Start provides parenting courses to families who live within the post code areas deemed to be the most deprived in Wales. The table below shows how many places were available in the last three years and the percentage of those places that were taken up. Teen conception rates, though currently above the Welsh average, have seen a significant downward trend in the last 20 years. The number and percentage of low births has not fluctuated much in the last ten years for Conwy CB. Numbers in Denbighshire are a little more volatile but suggest a trend towards improvement. Immunisation rates, which had seen a long term upward trend have seen a dip in recent years. Rate for the 5 in 1 primary immunisation (by age 1) have fallen slightly since 2013/14(from 96.8% to 96% in Conwy CB and from 96.6% to 96% in Denbighshire. There is a strong body of evidence of the importance of the first 1,000 days of a child’s life; addressing inequalities and intervening early to prevent health problems can help people make the best health choices for themselves now and for their children in the future. 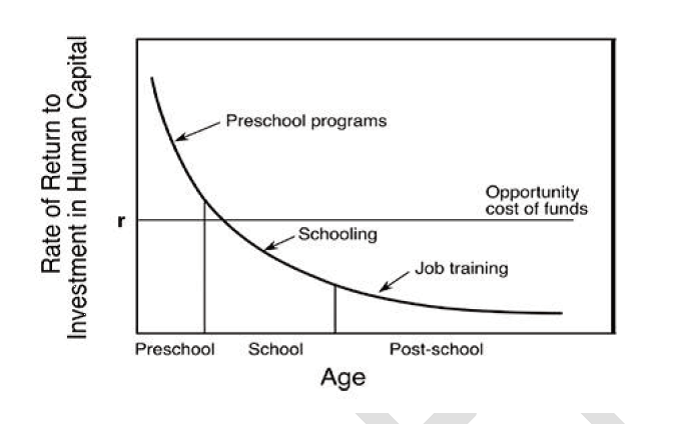 There is also a strong economic case for investing in the early years of life. The rate of economic return on investment is significantly higher in the pre-school stage than at any other stage of the education system. 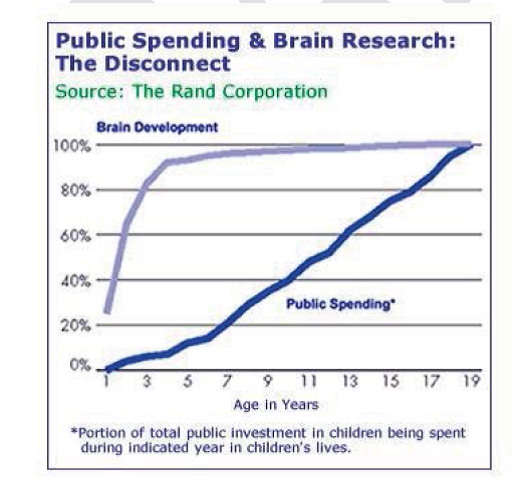 (See Figure 2.1.1) Despite this, investment in services for children and young people is often at its lowest in the very early years which are the most crucial in the development of the brain. Investment only increases at the point when development slows. (See Figure 2.1.2). Research from Public Health Wales shows the potential health and societal gains if childhood experiences are improved. In population terms, if there were no adverse childhood experiences, there could be 125,000 fewer smokers across Wales and some 55,000 fewer people who have ever used heroin and crack cocaine. This is cost-effective; the evidence shows that just over £100 invested in prevention of ACEs will result in over £6,000 of savings when measured across all public services over the next five years. There are a number of ways in which ACEs can be prevented or their impact lessened, including raising awareness of their importance, providing appropriate services for all families and reliable access to additional support for those who need it most. The benefits from this work points to the value of joint investments and partnerships between the NHS, local authorities and other services and agencies to effectively prevent ACEs in the future. Residents who responded to the consultation were keen that prevention measures be implemented to help break the cycle of poor parenting, which in turn could lead to reduced childhood obesity levels and people making healthier lifestyle choices for themselves.